Bun Me Baguette is a new food cart addition to Vancouver and serves just 2 types of baguettes - the lemongrass chicken and the lemongrass tofu baguette. If given a choice, I would always go for the meat option so I ordered the lemongrass chicken. They take time to warm up the baguette so when you bite into it, the baguette is nice and crispy on the outside but still soft on the inside. 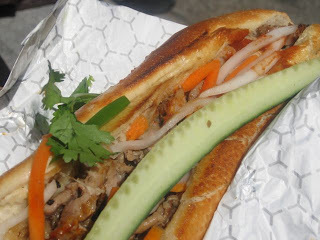 The lemongrass chicken had a good lemongrass taste and had just the right amount of pickles to complement the sandwich. I wished that there was more chicken but hey for $4.25 you can't really go wrong. I did see that they were going to raise their prices soon but they didn't say by how much.